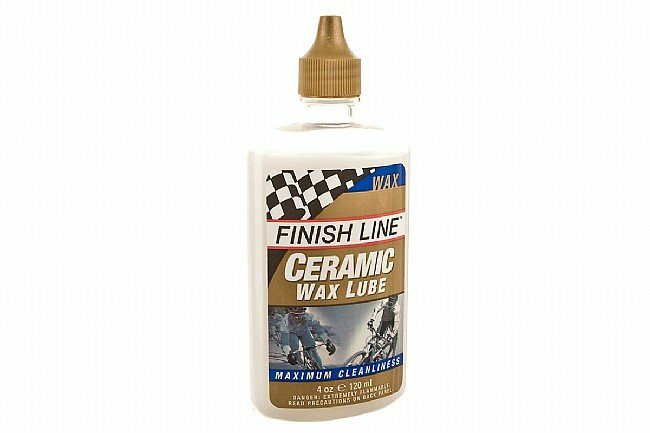 This Ceramic Wax Lube from Finish Line is wax-based, with nano-sized platelets of ceramic boron nitride and micro particles of fluoropolymer, for a lube that dries to form a low-friction coating that doesn't attract dirt and grime. The coating is enhanced with each application, but won't build up to form a wax film like many wax lubricants. Nor does it have a wetness or stickiness like many lubes that dirt and dust stick to. Four ounce squeeze bottle. Provides the chain with a very quiet ride. Nice product! Great job keeping my drivetrain clean. It last probably about as long as any dry lube on the market. Biggest drawback I experienced was build up after multiple applications made my chain very stiff. Clearly costing valuable watts on the road. Went back to my wet lube and noticed an immediate improvement. Keeps your chain cleaner than the finish line dry lube and others Ive used, however, it doesn't last as long. Ive used this lube dozens of times in the past few months. Ive used this for the road, mtb, cross and in cold, hot, dry, wet, weather though it lasts a bit longer in not so dry weather it is always dry here in my area. Once I get past the 25 mile mark my chain starts squeaking. My rides are quite long so I need something longer lasting so I will stick with the finish line dry lube instead. Recommended if your rides are short or you need the absolute cleanest chain. I usually only use wax lube in the winter because it doesn't last on long rides but this product is much better than others I have tried. Without the grit and grime chains last longer and won't tattoo your leg or stupid cat that walks under the bike. Using wax lube takes a little more planning as you can't use it on the way out the door, but I think it works better than all the other spaceage oil lubes I've tried. This lubricant works GREAT for chains and other applications! I use it for my Speedplay pedals as well. I've noticed that it will help clean a surface if you apply some before cleaning it (like the Speedplay pedals). Dries great! Leaves only a thin wax film (No smells once dried). It may not last very long between rides (100ish miles), but reapplying it is easy. Just make sure you shake the bottle before each use. If you use it directed, the liquid will clean off a lot of grime and deposit ceramic lube that will dry on the chain, the mixture has a lot of cleaner with a little lube, you can see the ceramic white material at the bottom of the bottle before you shake it, about 10% lube/90% cleaner, for that reason I wonder if it's a good value, I'm running through it pretty fast and it's questionable whether the chain is really clean. The lube quiets the chain/gears for summer conditions, I haven't used in rainy weather much, I'm anticipating needing to put it on after every ride in the rain. Seems like almost all lube formulas are going this way, but Finish line does make a dry teflon lube that seems to have more lube per bottle, I like that one better. Excellent lubrication, very quiet and great shifting. I am a competitive race riding 5 days a week averaging 300 miles a week.